(BGF) On February 19, 2014 the Boston Global Forum (BGF) hosted an event in which it announced a new and exciting initiative to recognize companies, brands, and retailers who are leading the way in worker safety and rights through the use of best practices. The event featured notable contributions from Governor Michael Dukakis, Chairman and co-founder of BGF, Arnold Zack, a renowned mediator, arbitrator and lecturer at Harvard Law School’s Labor and Worklife Program, Hedrick Smith, a Pulitzer Prize-winning journalist and former reporter and editor of the New York Times, and Marcy Goldstein-Gelb, the Executive Director of the Massachusetts Coalition for Occupational Safety and Health (MassCOSH). Gov. Dukakis kicked-off the event with an announcement about BGF’s new initiative. As he noted, BGF is seeking to build off of the success of the November 18, 2013 online conference on worker safety and rights. It is BGF’s hope that the new initiative will result in continued discussion on ways in which companies, brands, and retailers can promote worker safety and rights. Additionally, Gov. Dukakis noted the potential that the initiative to recognize companies, brands, and retailers who are leading the way in worker safety and rights through the use of best practices could provide guidance or the necessary pressure for other brands and retailers, who are not currently utilizing best practices, to follow suit. One of the key topics discussed throughout the event were the social and political causes for worker safety and rights issues. As Smith noted, the United States has undergone a transition from stakeholder capitalism, where CEOs answer to various stakeholders including their suppliers and customers, to shareholder capitalism, in which CEOs primarily answer to their shareholders. This focuses much more attention profits and reinforces a perspective that money and profits are the ultimate measuring stick against which everything else is measured. According to Smith, even when companies have corporate social responsibility (CSR) programs it will be interesting to see what companies are willing to do when worker safety issues impact their bottom-line. Relatedly, political factors contribute greatly to worker safety issues. Zack pointed out that there are 250 different international conventions on worker safety and rights promulgated by the International Labor Organization. Despite the apparent abundance of international conventions, there are no international laws addressing the issue. Making matters worse, international organizations, such as the World Trade Organization and G20 focus primarily on issues such as protecting intellectual property and cracking-down on tax havens, rather than worker safety and rights. Finally, the U.S. labor laws are weakly written and enforced, which prompted Smith to raise the question of how the U.S. can compel other countries to put in place and enforce worker safety and rights legislation when it cannot manage to do that at home? Even when social and political factors do not hinder efforts to promote worker safety and rights, issues of complexity and lack of transparency enter the picture. Goldstein-Gelb illustrated this point through a story about a man named Patrick who came to MassCOSH’s Worker Center. Patrick, Goldstein-Gelb said, worked on roofs in the Greater Boston area for an employer who refused to provide harnesses and other safety equipment. One day while working on a roof, Patrick fell and severely injured his back and legs. Yet, instead of taking Patrick directly to the hospital, Patrick’s employer took Patrick home, made Patrick change his clothes so it didn’t look like he was hurt on the job, and then made Patrick say he was hurt falling out of a tree while he was trying to save a cat. According to Goldstein-Gelb, these stories are not uncommon. Goldstein-Gelb’s story about Patrick reflects similar conditions experienced in workplaces around the world. For example, double-bookkeeping is a major issue that disguises true occupational safety and health conditions, according to Zack. Even without outright deceit by employers who operate in unsafe conditions, the sheer complexity of global supply-chains and production makes tracking worker safety and rights nearly impossible. As Zack elaborated, Gap and Disney produced their products in more than 10-15,000 factories which are located in more than 50 different countries. Given this complexity it is extremely difficult to effectively monitor working conditions in each and every one of those factories. What is more, the cost of monitoring safety conditions on such a large-scale is prohibitive for many companies and governments, which brings us back to codes of conduct and CSR policies. Thus, not only will codes of conduct and CSR policies be costly for companies, which could impact their commitment to enforcing those codes and policies, they may simply just be too difficult to implement. Even if a handful of factories are promoting worker safety and rights, it is likely that another set of factories producing for the same country may very well be operating in unsafe conditions. So, what can we do about all of this? One of the first things we need to accomplish, according to Goldstein-Gelb, is establish a workplace culture in which workers can speak up and raise concerns without having to fear that they will be penalized by their employers. The creation of unions and collective bargaining agreements can help in this respect by giving workers an outlet through which they can express their concerns. Ideally, this will create a scenario in which employers are willing speak up on behalf of state and federal workplace safety and health initiatives. These initiatives, according to Goldstein-Gelb, will benefit workers and employers as the workers will benefit from improvements in worker safety and rights, while employers will benefit from a level playing field in which all employers abide by the same standards. Secondly, according to Smith, we can attempt to engrain CSR policies and the idea of corporate citizenship into the overall business culture through business schools and their programs. By exposing business students to the importance of CSR and corporate citizenship while they are still students, we can help create a wave of future business leaders who are committed to improving worker safety and rights. nature of negotiations during the creation of Thirdly, we can push for greater transparency through supply-chain and factory audits, as well as the opening up of trade agreement negotiations. As Smith noted, the closed-door the Trans-Pacific Strategic Economic Partnership Agreement resulted in a lack of transparency and ultimately locked worker organizations out of the negotiations. Any efforts to create a great sense of transparency around worker safety and rights can help leverage improvements in factories or supply-chains where worker safety and rights are not being promoted. 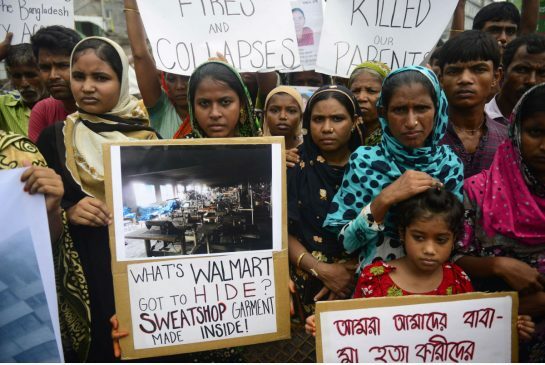 Finally, the Boston Global Forum attempts to recognize those companies, brands, and retailers who are leading the way on worker safety and rights issues. As Goldstein-Gelb noted, deterrence is a critical component to the improvement of worker safety and rights. Through the recognition of the companies, brands, and retailers who are leading the way on worker safety and rights issues through the use and promotion of best practices, BGF hopes to provide guidance and an incentive for companies to adopt best practices. Additionally, this initiative has the potential to enhance information-sharing and transparency around the issues of worker safety and rights. With your continued support, we can continue to push worker safety and rights to the forefront of international discussion and continue to pressure for change.